John Snee98 years old. 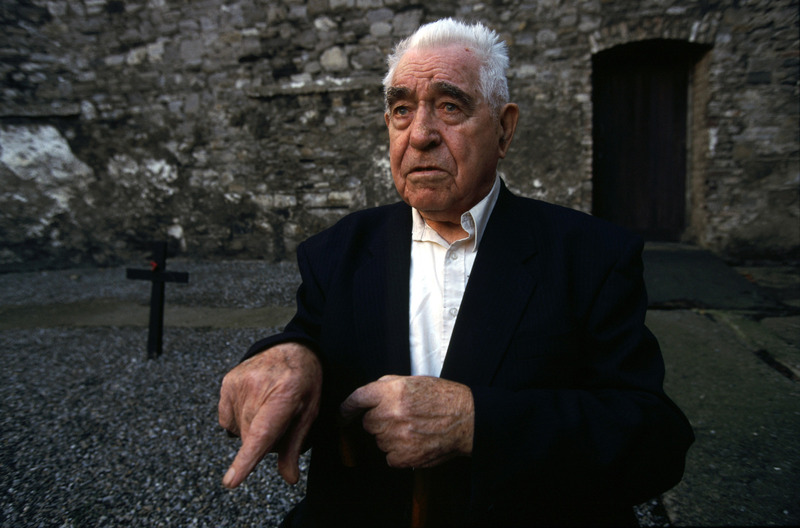 East Mayo Brigade Flying ColumnJohn Snee, photographed at 95 years of age in Kilmainham Gaol, Dublin. He is wearing his "Black and Tan "medal while seated in the execution yard in Kilmainham Gaol, where the leaders of the Easter 1916 Uprising were executed.He fought in the War of Independence against the British and on the Republican side against Michael Collins's Free State Army in the Civil War.He, along with an estimated 26,000 Republicans emigrated to America after the Civil War.He says: "I fought as a soldier against soldiers, not against women and children". Snee spent a 50 year exile in America. Apart from founding Republican pressure groups such as IRA Veterans of America, he also ran speakeasies in New York's Lower East Side and fought vicious turf wars with the Mafia. His oldest son is a decorated Vietnam vet .